Cold drinks with rum, first identified as “swizzles,” and later as Rum Swizzles, have been mentioned in literature since the mid 18th century. 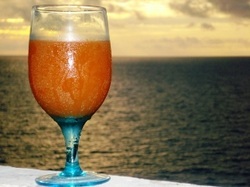 The rum swizzle is often called Bermuda’s national drink. In the earliest versions, the drink typically consisted of one part of rum diluted with five or six parts water (sometimes with additional aromatic ingredients), which was mixed by rotating a forked root stick between the palms. American naturalist and writer Frederick Ober noted in 1920 the drink of the Barbados ice houses called the swizzle, was a combination of liquors, sugar, and ice whisked to a froth by a rapidly revolved "swizzle-stick" made from the stem of a native plant, perhaps Quararibea turbinata (the "swizzle stick tree") or an allspice bush. You put the allspice stick in a glass filled with ice and other ingredients and then rotate the stick between your palms so the root end spins back and forth, churning your drink. This action helps to froth and chill the drink!